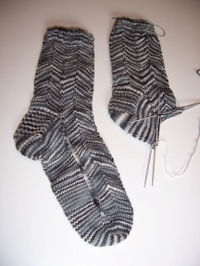 One By One: And I knit too! Just when I finally get a sewing machine and come here looking for inspiration. . . just then . . . you show us knitting again. Well, inspiration either way. I'm jealous. I'd rather be knitting tonight than speaking at a Kiwanis meeting about my work. Wanna trade?